Croc Roc is a living legend in the music industry making a comeback with the help of his friends! From Chuck’s early childhood, his parent’s interest in music and the movement of Rock and Roll in the fifties would be a major influence and catalyst in his life later becoming the creator of the Croc Roc and the cast of characters. Since these characters are basically told through the lens of experiences in Chuck’s life. those he met in became influential in who and what Chuck and CROC ROC has the images of characters what they looked like, formed their personalities and created who they were….and then he would take this dream and draw them all on paper. One night, while driving to dinner with friends, Chuck Wood had a vision, a flash of a character that would later become CROC ROC the rock legend! He’s a living legend!! That night, Chuck began writing and creating the character and quickly the rock legend was created. 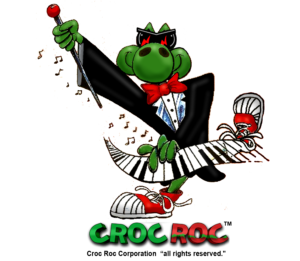 As a kid, Chuck has this vision of CROC ROC with a tux, red boogie shoes, bow tie and cool sunglasses looking like Leon Redbone! Today CROC ROC is impacting many lives! Chuck founded the Croc Roc Academy of Arts & Sciences, a holistic and unique approach to Science, Technology, Engineering, Arithmetic and Music ( STEAM). CROC ROC Academy is dedicated to ensuring children of all ages can experience musical concepts, absorb patterning through ear training, singing, and rhythmic activities. As skills grow, students will enhance their total musical development and become our future leaders.